Smaller and lighter - yet highly durable. That's what we created with the FullLife full-face mask. A revolutionary design makes FullLife a great choice for both men and women who need a full-face mask but prefer something more compact and less intrusive than other full-face masks. To accomplish that, we eliminated the conventional forehead pad and provided a clear sight line. To enhance comfort, we used a dual-textured cushion that aids with assembly and prevents mask movement on the face. 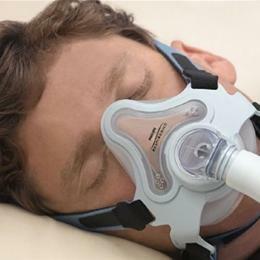 A clever headgear design further improves mask fit while simplifying application and removal.